Glory (03519) kabod - Hebrew word for "Glory"
Ex 13:20, 21 First description of the Shekinah as "pillar of cloud by day" and "pillar of fire by night". Guidance and assurance of Jehovah's presence and power. Ex 24:16 Shekinah glory of Jehovah rested on Mt Sinai = the cloud = like a consuming fire. 1Cor 10:1 Paul wants us to be aware that our "fathers were under" the Shekinah cloud. Jn 17:22 Jesus "And the glory which Thou hast given Me I have given to them; that they may be one, just as We are one." 1Cor 10:31 Whether, then, you eat or drink or whatever you do, do all to the glory of God." Test all conduct by whether or not it manifests the characteristics of God and so gives a proper opinion of ("glorifies") Him to others. Matthew 24:30-note "the SON OF MAN COMING ON THE CLOUDS OF THE SKY with power and great glory." 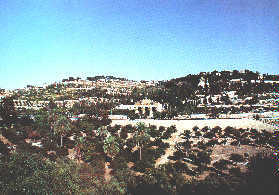 Zech 14:4-note records that "In that day His feet will stand on the Mount of Olives." After defeating the armies of the Gentile nations, He will establish His Millennial Kingdom with a rebuilt Holy Temple. Haggai 2:9 The Latter glory of (Millennial Temple - see note) will be greater than the former (Solomon's Temple). Isaiah 35:1, 2, 3: In the Millennium, the land of Israel will be restored to its former glory and all will see "the glory of Jehovah" as Messiah reigns in Jerusalem. CONTEXT -- Ezekiel's description of the progressive departure of the Glory in Ezekiel 8-11 (See notes beginning on Ezekiel 8) is recorded 14 months after Ezekiel is called to be God's prophet to the Exiles in Babylon, he is carried in vision to Jerusalem where we can trace the step-by-step departure of the Glory of the LORD. brought me in the visions of God to Jerusalem, to the entrance of the north gate of the inner court, where the seat of the idol of jealousy, which provokes to jealousy, was located. And behold, the glory of the God of Israel was there, like the appearance which I saw in the plain. Ezekiel 8 describes a series of four "abominations" involving God's Holy Temple, but as described in Ezek 8:4 the Glory of the LORD is still present, presumably in the Holy of holies although that is not specifically stated. Then the glory of the God of Israel went up from the cherub on which it had been, to the threshold of the temple. And He called to the man clothed in linen at whose loins was the writing case." Then the glory of the LORD went up from the cherub to the threshold of the temple, and the temple was filled with the cloud, and the court was filled with the brightness of the glory of the LORD." then the glory of the LORD departed from the threshold of the temple and stood over the cherubim. When the cherubim departed, they lifted their wings and rose up from the earth in my sight with the wheels beside them; and they stood still at the entrance of the east gate of the LORD'S house. And the glory of the God of Israel hovered over them. Then the cherubim lifted up their wings with the wheels beside them, and the glory of the God of Israel hovered over them. And the glory of the LORD went up from the midst of the city, and stood over the mountain which is east of the city. The Scripture then falls silent but the clear implication is that the glory of the LORD has departed from His dwelling place among man. Glory is the Hebrew word kabod (03519) which means to be heavy or weighty and by figurative extension describes that which is "weighty" or important. The Septuagint translates kabod with the Greek word doxa, which in simple terms means that which gives a proper opinion of some one or some thing. And so God's glory gives us a proper opinion of Who He is, providing a glimpse into His beauty, brilliance, effulgence, and radiance. It follows then that the glory of the LORD has always existed. These notes will not address so much that aspect of God's glory (seen in creation, etc) but will overview the specific manifestations of His glory throughout history, past, present and future. The Shechinah in "Sabbath Morning Readings in the Old Testament"
In order to help understand the specific manifestations of God's glory it is important to understand the frequently used term, Shekinah. the visible manifestation of the presence of God. It is the majestic presence or manifestation of God in which He descended to dwell among men. Whenever the invisible God becomes visible, and whenever the omnipresence of God is localized, this is the Shechinah Glory. The usual title found in the Scriptures for the Shechinah Glory is: the glory of the Lord. The Hebrew form is Kvod Adonai (word study), which means “the glory of the Lord,” and describes what the Shechinah Glory is. The Greek title, Doxa Kurion (kurios), is also translated as “the glory of the Lord.” Doxa (word study) means “brightness,” “brilliance,” or “splendor” and it depicts how the Shechinah Glory appears. Other titles give it the sense of “dwelling,” which portrays what the Shechinah Glory does. The Hebrew for Shechinah, from the root shachan, means “to dwell.” The Greek word skeinei (see study of related words - skenos and skenoma) means “to tabernacle,” and is derived from the Hebrew Shechinah. And they shall make before me a sanctuary and I shall cause my Shekinah to dwell among them. In summary, the term Shekinah as commonly used describes the visible manifestation of God's presence and glory usually in the form of a cloud as discussed below under Past Glory. Spurgeon Commenting on John 1:14 observes believers have something (Someone) far better than the Shekinah Glory Cloud of Israel in the Old Testament: In and around the tent (The OT Tabernacle) wherein the Lord dwelt in the center of the camp there was a manifestation of the presence of God. but how scanty was the revelation! A bright light which I have already mentioned, the Shekinah, is said to have shone over the Mercy-Seat; but the high priest only could see it, and he only saw it once in the year when he entered with blood within the veil. Outside, above the holy place, there was the manifest glory of the pillar of cloud by day, and of fire by night. This sufficed to bear witness that God was there; but still, cloud and fire are but physical appearances, and cannot convey a true appearance of God, who is a spirit. God cannot be perceived by the senses; and yet the fiery, cloudy pillar could appeal to the eyes only. The excellence of the indwelling of God in Christ is this — that there is in Him a glory as of the only begotten of the Father, the moral and spiritual glory of Godhead. This is to be seen, but not with the eyes — this is to be perceived, but not by the carnal senses: this is seen, and heard, and known, by spiritual men, whose mental perceptions are keener than those of sight and hearing. (cf Mt 16:17, Mt 11:25, 26, 27, Jn 6:44) In the Person of the Lord there is a glory which is seen by our faith (2Cor 5:7, 2Cor 4:18), which is discerned of our renewed spirits, and is made to operate upon our hearts. The glory of God in the sanctuary was seen only by the priest of the house of Aaron; the glory of God in the face of Christ is seen by all believers, who are all priests unto God. That glory the priest beheld but once in the year; but we steadily behold that glory at all times, and are transformed by the sight (2Cor 3:18). The glory of God in the face of Jesus Christ (2Cor 4:6) is not a thing of outward appearance, to be beheld with the eyes, like the pillar of cloud and fire; but there is an abiding, steady luster of holy, gracious, truthful character about our Lord Jesus Christ, which is best seen by those who by reason of sanctification are made fit to discern it. Do I perceive his glory? Have I seen something of the splendor of God in the humble man of Nazareth? Have I learned to magnify him in my soul, and have I desired to glorify him in my life, as my God, my life, my love, my all in all, though once despised and rejected of men? Comment: Ponder (meditate on) this truly awesome thought for a moment - the Shekinah Glory of God in us as Christ followers! How can we comprehend such mystery and majesty? And yet it is our privilege to show forth the Shekinah glory for all the world to see! How? Comment: The definite article "the" is present before "flaming sword" which makes this a very specific entity - the flame of the sword. It is possible that this is the first manifestation of the Shekinah glory of the Lord. It is also worth noting that Cherubim are elsewhere associated with the appearance of the Shekinah Glory (see below). Comment: This example of the glory of God is another possible manifestation of the Shekinah Glory. It would certainly be fitting that the Shekinah Glory would be present at what amounts to Jehovah's "signing" of the unconditional Abrahamic Covenant. 2Samuel 6:2 And David arose and went with all the people who were with him to Baale-judah, to bring up from there the ark of God which is called by the Name, the very name of the LORD of hosts Who is enthroned above the cherubim. 2Kings 19:15 And Hezekiah prayed before the LORD and said, "O LORD, the God of Israel, Who art enthroned above the cherubim, Thou art the God, Thou alone, of all the kingdoms of the earth. Thou hast made heaven and earth. 1Chronicles 13:6 And David and all Israel went up to Baalah, that is, to Kiriath-jearim, which belongs to Judah, to bring up from there the ark of God, the LORD Who is enthroned above the cherubim, where His name is called. Ps 80:1 (For the choir director; set to El Shoshannim; Eduth. A Psalm of Asaph.) Oh, give ear, Shepherd of Israel, Thou who dost lead Joseph like a flock; Thou Who art enthroned above the cherubim, shine forth! Ps 99:1 The LORD reigns, let the peoples tremble; He is enthroned above the cherubim, let the earth shake! Ps 132:8 Arise, O LORD, to Thy resting place; Thou and the ark of Thy strength. In essence we have here a prayer by the psalmist for Jehovah to descend in the Shekinah (the glory cloud) and dwell above the ark of the covenant. Spurgeon comments : In these three verses we see the finders of the ark removing it to its appointed place, using a formula somewhat like to that used by Moses when he said, "Rise up, Lord", and again, "Return, O Lord, unto the many thousands of Israel." The ark had been long upon the move, and no fit place had been found for it in Canaan, but now devout men have prepared a temple, and they sing, Arise, O Lord, into thy rest; thou, and the ark of thy strength. They hoped that now the covenant symbol had found a permanent abode -- a rest, and they trusted that Jehovah would now abide with it for ever. Vain would it be for the ark to be settled if the Lord did not continue with it, and perpetually shine forth from between the cherubim. Unless the Lord shall rest with us there is no rest for us; unless the ark of his strength abide with us we are ourselves without strength. The ark of the covenant is here mentioned by a name which it well deserved; for in its captivity it smote its captors, and broke their gods, and when it was brought back it guarded its own honour by the death of those who dared to treat it with disrespect. The power of God was thus connected with the sacred chest. Reverently, therefore, did Solomon pray concerning it as he besought the living God to consecrate the temple by his presence. It is the Lord and the covenant, or rather say the covenant Jehovah whose presence we desire in our assemblies, and this presence is the strength of his people. Oh that the Lord would indeed abide in all the churches, and cause his power to be revealed in Zion. Isa 37:16 "O LORD of hosts, the God of Israel, Who art enthroned above the cherubim, Thou art the God, Thou alone, of all the kingdoms of the earth. Thou hast made heaven and earth. It should never be forgotten that nothing can afford to us protection and succor but vital union with Christ. We must hide in His secret place if we would abide under His shadow. We must dwell in the most holy place if we would be shadowed by the wings of the Shekinah. There must be nothing between us and God, if we are to walk together, and enjoy fellowship with the Father, and with His Son, Jesus Christ. The verb the NIV translates “covered” is literally the verb שכן)) “dwelt.” The glory of the Lord dwelt upon the mountain. It will be used later in a technical sense of God’s Shekinah, the outward manifestation of his presence to men. From this we get the idea of the God “tabernacling” with men in John 1:14. “We have seen his glory,” John says, when the Word dwelt among men. Guzik: The cloud of Shekinah glory overshadowed Israel throughout their journey from Egypt to the Promised Land. During the day, the cloud sheltered them from the brutal desert sun, and during the night, it burned as a pillar of fire. It was a constant, ready reminder of God’s glory and presence (Exodus 13:21-22). "The Indwelling of the Spirit" makes the believers body a temple for the indwelling of the Lord Jesus Christ, the Shekinah Glory (Ro 8:9-11; 1 Cor. 3:16; 6:19-20; 2 Cor. 6:16). 2Cor 12:9-note And He has said to me, "My grace is sufficient for you, for power is perfected in weakness." Most gladly, therefore, I will rather boast about my weaknesses, that the power of Christ may dwell (episkenoo) in me. Comment: The verb episkenoo means literally to pitch a tent upon and thus to descend and abide upon or rest upon. This is the only use of this verb in Scripture. The picture as portrayed in Wuest's paraphrase reminds us of the OT Shekinah Glory, depicting the presence of Jehovah upon the Mercy Seat in the Holy of holies. A T Robertson adds that episkenoo means: to fix a tent upon, here upon Paul himself by a bold metaphor, as if the Shekinah of the Lord was overshadowing him (cf. Lk 9:34), the power (dunamis) of the Lord Jesus." "May dwell in me" is picture similar to that which describes God descending from heaven and dwelling in the tabernacle among the people of Israel. And so here in 2Corinthians 12:9 Paul employs dramatic imagery teaching NT believers that the glorious Christ “pitches His tent” with His people in their weaknesses, not with the "rich and famous and powerful"! As Hughes says "Christ pitches his tent with the weak and the unknown, the suffering shut-in, the anonymous pastor and missionary, the godly, quiet servants in the home and the marketplace." Wuest paraphrases Paul: And He has said to me, and His declaration still stands, My grace is enough for you, for power is moment by moment coming to its full energy and complete operation in the sphere of weakness. Therefore, most gladly will I the rather boast in my weaknesses in order that the power of the Christ [like the Shekinah Glory in the Holy of Holies of the Tent of Meeting] may take up its residence in me [working within me and giving me help]. Hodge commenting on most gladly writes that Paul is saying: most sweetly, with an acquiescence delightful to himself. His sufferings thus became the source of the purest and highest pleasure. I will rather boast about my weaknesses does not mean "I glory in the midst of infirmities", but on account of them. This rejoicing on account of his sufferings or those things which implied his weakness and dependence, was not a fanatical feeling, (but) it had a rational and sufficient basis, viz., that the power of Christ may rest upon me; i.e., dwell in me as in a tent, as the Shekinah dwelt in olden days on the tabernacle. To be made thus the dwelling place of the power of Christ, where He reveals His glory, was a rational ground of rejoicing in those infirmities which were the his present condition and the occasion for the manifestation of Christ's power. Most Christians are satisfied in trying to be resigned under suffering. They think it a great thing if they can bring themselves to submit to be the dwelling-place of Christ's power. To rejoice in their afflictions because thereby Christ is glorified, is more than they aspire to. Paul's experience was far above that standard. SHEKINAH, the visible sign of God's presence on the ark of testimony in the Holy of holies, Ex 25:22; Lev 16:2; 2Sa 6:2; 2Ki 19:14, 15; Ps 80:1; Isa 37:16; Eze 9:3; 10:18; He 9:5. SHEKINAH - she-ki'-na (shekhinah, "that which dwells," from the verb shakhen, or shakhan, "to dwell," "reside"): This word is not found in the Bible, but there are allusions to it in Is 60:2; Mt 17:5; Lk 2:9; Ro 9:4. It is first found in the Targums. WE BEHELD HIS GLORY: The glory of God—the Shekinah, the abiding presence—is the manifestation of God’s being and presence to mankind, sometimes in a visible form. In the Old Testament it was seen in the cloud and pillar of fire which led the Israelites through the trackless wilderness, Ex 13:21–22. 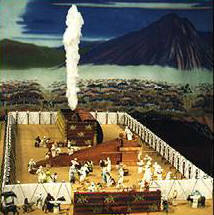 Later, it filled the completed tabernacle, Ex. 40:34–35, and temple, 1Kgs. 8:10–11; 2Chr 7:1–3, and indicated with awesome magnificence God dwelling among His people. The glory of God is the keynote of Ezekiel’s prophecy; it is mentioned twelve times in chapters 1–11 and again in chapter 43. Ezekiel, now a captive in exile, is transported by the Spirit of God to the temple in Jerusalem where he is shown the idolatrous practices taking place in the temple. There he witnesses the glory of God leaving the temple on account of the evil of the nation, which could be well described by the name Ichabod, given to one of Eli’s grandsons on the occasion of the capture of the ark of God by the Philistines, meaning ‘the glory is departed from Israel’, 1 Sam. 4:21. Ezekiel records that the glory of God would not return until the future millennial temple was built, Ezek. 43:2–5. In the New Testament the glory of God is beheld again, not in an earthly temple, but in the person of the incarnate Son who tabernacled here among His people. John states, ‘We beheld his glory, the glory as of the only begotten of the Father, full of grace and truth’, John. 1:14. He is the outshining of divine glory, Heb. 1:3. This was revealed in His person, His miracles, John 2:11, at His transfiguration, Matt. 17:1–8; Mark 9:2–8; Luke 9:28–36, in His death, John 7:39; 12:23–28; 13:31; 17:5, His resurrection and ascension, Luke 24:26; Acts 3:13; 7:55; Rom. 6:4. Paul wrote that the glory of God is seen in the face of Jesus Christ, 2 Cor. 4:6, and this glory is reflected by the church, which constitutes God’s temple on earth; cf. Eph. 2:21. Ezekiel witnessed the departure of the glory of God; how important it is for us to maintain holy lives of radiant testimony so that others may see His Glory reside in, and radiate out, from us. THE GLORY OF GOD RETURNS - The last nine chapters of Ezekiel portray the temple, the sacrificial worship, the land and the people of Israel in the millennium. Previously, in Chapter 11, the glory of God had departed from Solomon’s temple by way of the eastern gate, but in this closing section of the prophecy Ezekiel describes the return of the glory of God to consecrate the newly constructed millennial temple, Ezek. 43:1–5. 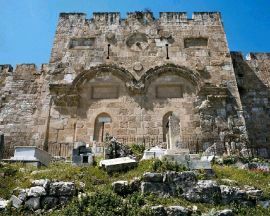 The Shekinah glory returned by way of the eastern gate, the direction from which it previously had left; the glory of God thus ‘filled the house’ as it had done at the consecration of the completed tabernacle, Ex. 40:34–35, and Solomon’s temple, 1 Kgs. 8:10–11; 2Chr 5:13–14. Having returned, God spoke to Ezekiel from the house, ‘Son of man, the place of my throne and the place of the soles of my feet, where I shall dwell in the midst of the children of Israel for ever’, Ezek. 43:7. The implication is that the Shekinah glory would never depart again. Between these two events, the glory of God dwelt among men in the person of the Word who became flesh, John 1:1, 14. The incarnate Word temporarily ‘pitched his tent on the desert sands of time’ and, says John, ‘we beheld his glory, the glory as of the only begotten of the Father, full of grace and truth, John 1:14. That glory was resident in the temple of His body, John 2:21. It was exhibited in His character and acts; His life and walk, His miracles, as turning water into wine, John 2:11, and the raising of Lazarus, John 11:4, 40, His transfiguration, 2 Pet. 1:17, His resurrection, Rom. 6:4, His ascension and exaltation, 1 Pet. 1:21, but pre-eminently in His cross work, the hour of His glory. As He anticipated the cross He said, ‘The hour is come that the Son of man should be glorified’, John 12:23.